Looking for something moreish to take along to a Christmas party? 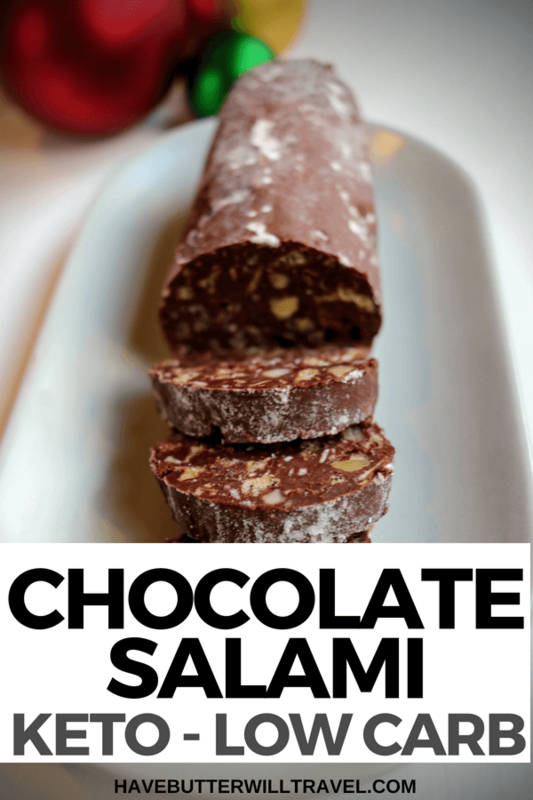 Look no further as this keto chocolate salami is a hit with everyone and is so easy to make ahead. Crunchy and sweet with a rich chocolate flavour it is the prefect sweet bite at anytime of the day. 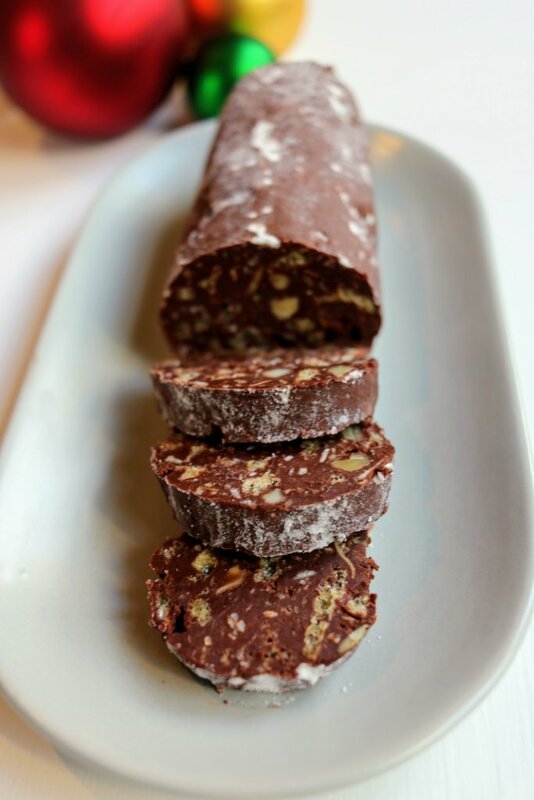 Chocolate salami is a traditional Italian treat known as Salami di Cioccolato which is popular at Christmas time. Traditionally it does not contain any meat, but is called salami due to the resemblance. 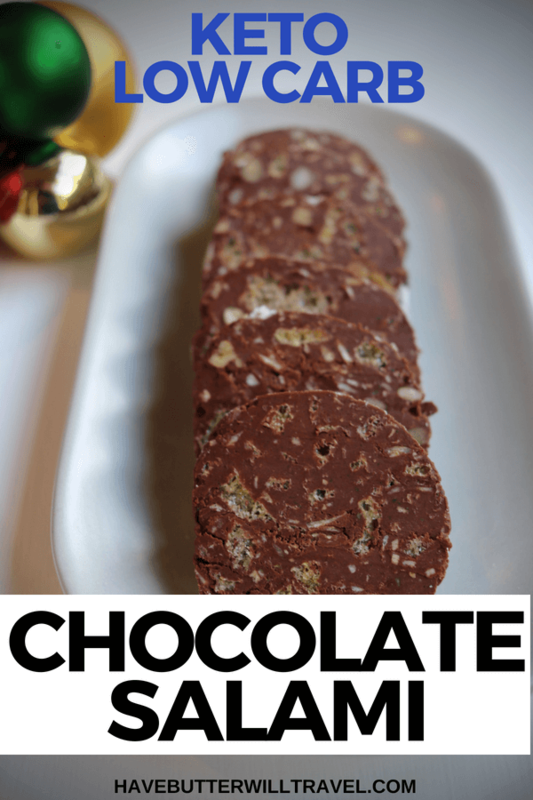 To ketofy our chocolate salami we wanted to find a crunchy alternative to the shortbread cookies that are normally included. 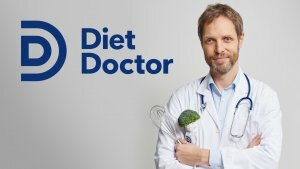 It can be tricky to make a crunchy keto cookie, without traditional flour and sugar, so we ruled that out. Which led us to … pork rinds, yes pork rinds! I know, don’t freak out. The pork rinds just give a nice crunchiness similar to a rice bubble (rise krispie), trust me. Make sure they are good quality pork rinds/crackle chips with no junky ingredients and are light, airy and crispy. You can find our Nut & Seed Granola recipe here. Instead of the granola you can use a mixture of coconut and whatever nuts you have on hand. If you don’t have powdered sweetener (which is icing sugar consistency) you can grind granulated sweetener in a blender or food processor to make a finer powder. 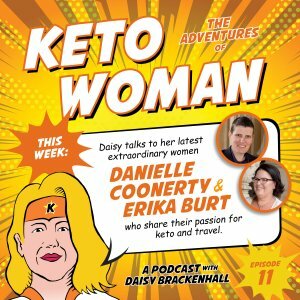 Tag @havebutterwilltravel on Instagram with photos of your keto chocolate salami creations as we would love to see them! Looking for something moreish to take along to a Xmas party? Look no further as this keto chocolate salami is a hit with everyone and easy to make ahead. Melt the chocolate in a glass bowl over a pan of simmering water. Set aside to cool. Beat the butter, sweetener and vanilla on high speed until pale and fluffy. Add the egg and beat on low speed until combined. It may appear to split, but don't panic it will come together. Add the cooled chocolate to the butter mixture and stir to combine until completely smooth. Shape the mixture into a log approximately 30cms long on a sheet of glad wrap. Wrap tightly and twist the ends of the glad wrap (like a bon bon) to tighten and smooth the sides. Refrigerate overnight to set. To serve, remove from the glad wrap. Dust with powdered sweetener and and slice into 1 cm rounds. What about the raw egg in this ? It is not cooked, concerned about getting sick from raw eggs. We don’t have a problem with consuming raw egg yolks as long as you are purchasing good quality free range/pastured eggs. I guess it is personal preference though. Do you think it would work without the raw egg? Hi! This looks yummy, how many servings? It’s 30 Serves. Each serve is 1cm thick. When we make it we get about a 30cm log from that mixture. Hope this helps. I can vouch that I wasn’t sure about it, but once I tried it, I was impressed. The pork rinds are a bit off putting, but they have no flavour and give it a rice bubble texture. 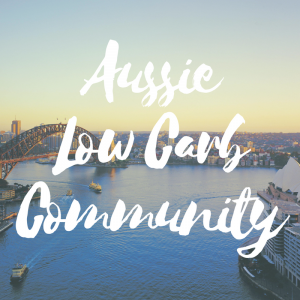 Let us know if you make it and what you think. I am Portuguese and chocolate salami is a popular treat for us, so I am very curious to try this. What brand(s) of pork rinds do you recommend? Our recommendation is that you use the airy, crunchy ones. They also need to be plain and if you can find ones that aren’t cooked in canola oil, but are cooked in pork fat, they are the best. The pork rinds don’t add flavour, but they add a delicious texture. 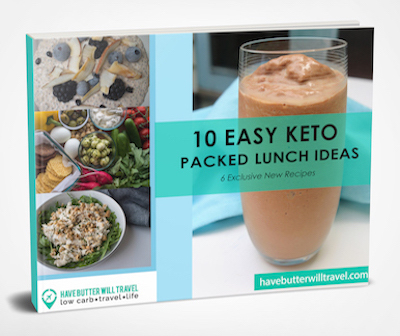 sounds like good snow hiking food! Yes Jodie – Sure would be! To clarify, is the chocolate unsweetened bakers squares? Hi Maryann! We used 85% dark chocolate in the recipe. You can use unsweetened (100%) chocolate but you may need to add in some more sweetener. Hope this helps! Not sure how I could stuff up something so easy, after making about 12 rolls (non keto) for friends last Christmas, but anyway it was a disaster! Oh no Lynn! What happened?? At least you salvaged it. Totally fell apart on cuting. If I make it again, I will cut the nuts up a bit as they were so hard!